LE@D’Talks – For a framework for evaluating the quality and effectiveness of the MOOC: the case of quality in sMOOC Brazil / Portugal. October 19, 2017, in the Auditorium 3 of Palácio Ceia, with researcher Flávio Souza of the Federal University of Fuminense, Brazil. LE@D’Talks – For an education centred on the Open and the Doers (Para uma educação centrada no Aberto e nos Fazedores). September 7, 2016, in the Noble Hall of UAb with Prof. Nelson Pretto, Faculty of Education, Federal University of Bahia (UFBA), Brazil. LE@D’Talks – The analog, the digital and the virtual: Neuroscientific dialogue of learning towards the humanization of individuals (O analógico, o digital e o virtual: Diálogo neurocientífico da aprendizagem rumo à humanização do indivíduos). November 7, 2016, in the Noble Hall of the UAb, with Prof. Susane Garrido, University TUIUTI of Paraná, Brazil. LE@D´Talks – devoted to the design of online training, this edition counted with the participation of LE@D researcher, PhD Teresa Pessoa – Designing distance formative paths: models and practices (Desenhar percursos formativos a distância: modelos e práticas) -, and the researcher PhD Fernanda Nogueira – Strategic design of distance professional training (Desenho estratégico da formação profissional a distância). April 28, 2016. Palácio Ceia, Universidade Aberta. LE@D’Talks – Learning foreign languages in online and multimedia contexts (A aprendizagem das línguas estrangeiras em contextos online e multimédia). February 27, 2016, Palácio Ceia, with the researcher António Chenoll, from the Portuguese Catholic University. LE@D´Talks – this edition had the participation of LE@D scientific coordinator PhD Teresa Cardoso and the theme was “Research at LE@D between 2007-2015” (A investigação no LE@D entre 2007- 2015); it also had the participation of associated researcher (during 2013) Suyanne Souza, from Pontifícia Universidade Católica do Paraná- PUC-PR, entitled “Mediated language and education” (Linguagem mediatizada e Educação: A utilização do vídeo no ensino superior). November 10, 2017. Auditório 3, Palácio Ceia, Universidade Aberta. LE@D´Talks – this edition was entitled “Conversations with…. Prof. Diene Eire de Melo” (Conversas com… Profª Diene Eire de Melo), from Universidade Estadual de Londrina no Paraná– Brasil. 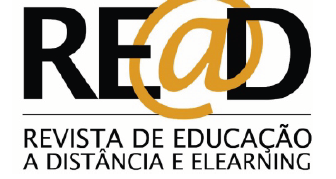 It was co-organized by DEED and LE@D, and resulted in the conference “Elements of Online Didactics: some reflexions” (Elementos da Didática do Online: algumas reflexões). March 17, 2015. Palácio Ceia, Universidade Aberta. 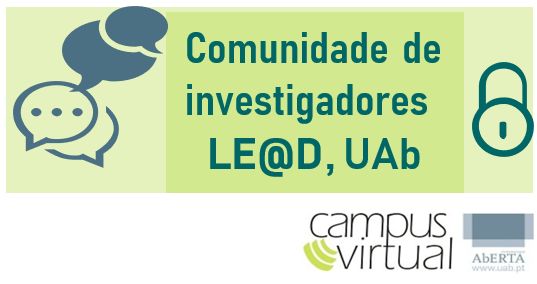 E@D´Talks – “Aumented Gamification: amplifying learning in hibrid spaces” (Gamificação Aumentada: ampliando a aprendizagem em espaços híbridos), resulted in a conference of PhD Paula Carolei, from Universidade Aberta – Brasil. February 3, 2015. Palácio Ceia, Universidade Aberta. LE@D´Talks , devoted to Cyberculture (Cibercultura), had the participation of researchers Edméa Santos from UERJ, UniversidadeEstadual do Rio de Janeiro and Telma Brito Rocha, from Instituto Federal de Ciência e Tecnologia da Bahia, Brasil. November 4, 2013. Palácio Ceia, Universidade Aberta. LE@D Works & Talks. Held for the first time simultaneously, LE@D Works & Talks 2013 presented 2 parts corresponding to different objectives for the dissemination and sharing of results from research developed: the 1st part concerning LE@D Works, with Laura Azevedo from CECOA and Claúdia Neves from LE@D. The 2nd part, LE@D´Talks, with the participation of two international speakers Eliza Pupiales Rueda from Universidade Internacional La Rioja & Universidade Nariño – Colombia and Covadonga Rodrigo from UNED -Espanha. July 26, 2013. Palácio Ceia, Universidade Aberta. LE@D’Works – W3i Workshop. Investigating the Digital Age (Workshop W31. Investigar na era digital)., December 22, 2012, Palácio Ceia, Universidade Aberta.